A combination of pilot house and flying bridge, it offered both function and ambiance in a different form than convention dictated. There was a synergy between these two elements catalyzed by the use of the astonishingly translucent EverClear windows. The dream of a liberating, open yet protected living space, with superior perspective, suddenly became reality. Consider how the FP 97 Matrix Deck will function. You exit the Great Room on the main deck and, if desired, stay totally protected fas you climb the stairway. At sea, the lines of sight are excellent through 90% of your potential view field, and by moving a few steps you cover the other 10%. You are positioned in the zone of maximum comfort for head seas. When conning in difficult circumstances, you not only have good sight lines, but with some or all of the windows open you are in touch with the surroundings in manner that cannot be duplicated when inside. Situational awareness is enhanced. Couple this high degree of function with the ambiance of a lovely salon, or tropical lanai. The con is central, guests or mate can enjoy the passage with you, in extreme comfort at sea and with astonishing views at anchor. You have the choice of heating this area with the ship’s diesel boiler, air conditioning, or best of all, simply opening some or all of the surround perimeter for natural air flow. The helm is designed for maximum situational awareness during routine periods on watch and when piloting in challenging conditions. The wings on each side provide a convenient location for books, the log, a snack, and serve to hold you in place. The trombone-shaped rail projecting aft from the desk helps to confine your body, and slips forward out of the way when not required. There is plenty of monitor room: five nineteen-inch screens are shown, with sufficient desk space for the usual dials, knobs, and gauges. The volume of the Matrix Deck is enormous: 6.8m/22′ by 4.4m/14′. That is as large as the Great Room on the FPB 83 Wind Horse. 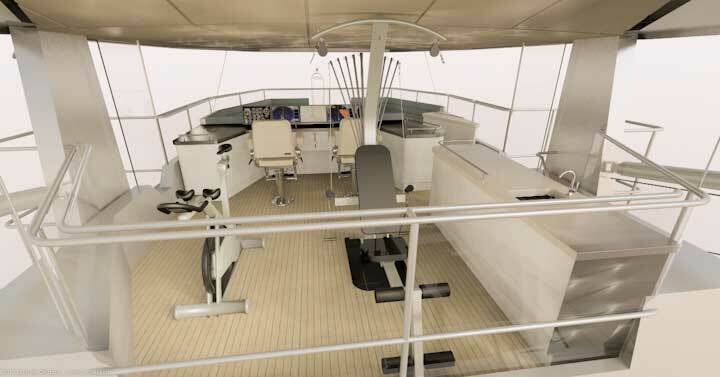 The layout is well aft and the helm, centered in the Matrix Deck (just forward of the masts) is directly on the projected pitch axis for minimum acceleration and maximum comfort (not that this yacht will feel much going uphill). 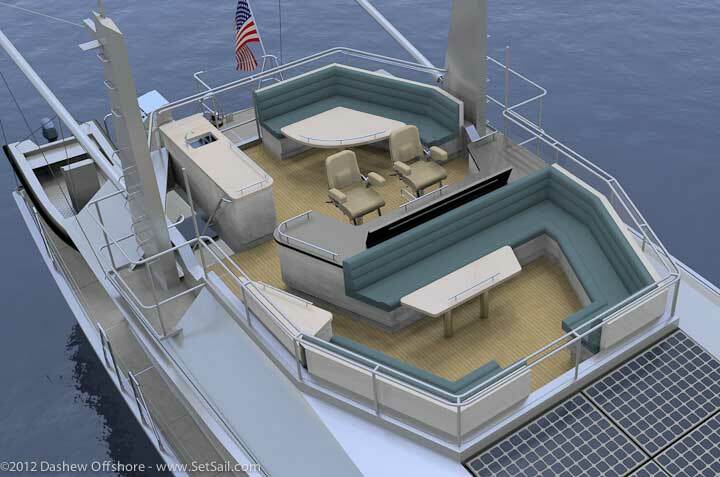 The furniture is positioned to provide support at sea, yet retain an open feeling at anchor. Sufficient space is on hand for two groups of guests, should you choose to share your worldy view. The Matrix Deck is surrounded by an EverClear window system, similar to what was recently installed on Wind Horse. This is significantly more clear than conventional structural glass. EverClears also block UV radiation and hinge open from the outside towards the interior. Cold rainy day, windows closed. Nice day, let’s open them (and if we’re in the tropics maybe they will all be open). Aside from two separate social groupings, with good circulation, the settees forward are a great place from which to keep watch offshore. They also provide a comfortable spot for the off watch to sleep, close at hand for a quick consultation should the need arise. Sight lines are always a problem with larger yachts; often it’s impossible for the skipper to see his/her crew, the ends of the boat, or the dock. This results in tension, occasional expensive and embarrassing operator error, and the use of those crew headsets. There are also issues of ships creeping up from aft, and debris, ice, and small boats close in under the bow. 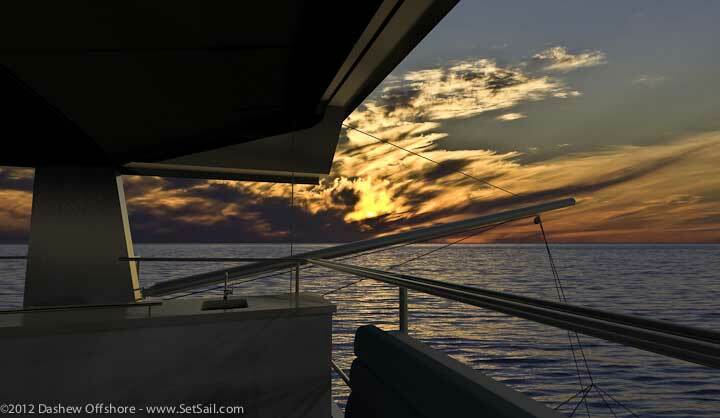 Using 3D models we are able to simulate the view field from anywhere on the boat, and the layout of the Matrix Deck will give good visibility in almost all conditions. And if you are working in ice or debris strewn waters, walk 3m/10 feet forward in the Matrix Deck and you can see within half a boat length of the bow. 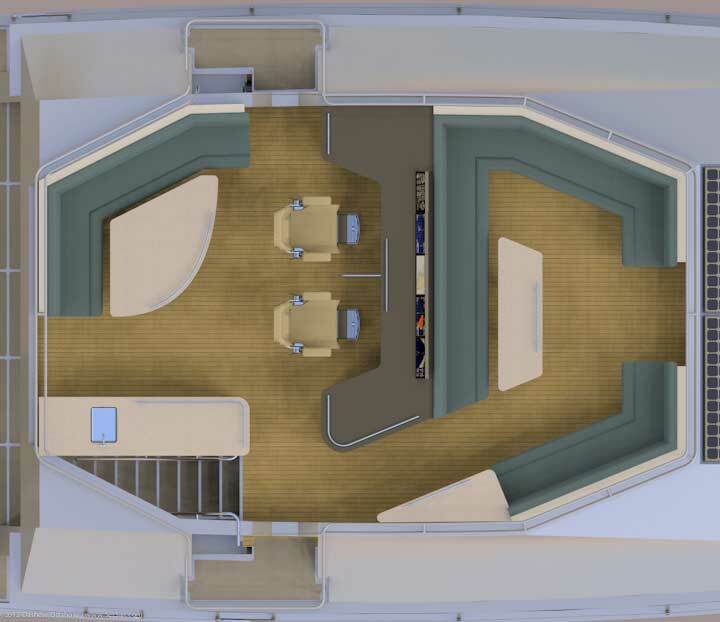 The after deck area has many possibilities and with a 26’/8m forepeak in which to store furniture, it will be possible to mix and match between the various areas on the main and upper decks that lend themselves so well to entertaining. The layout above could be called a classic use of this space. Leave this open and it becomes a romantic dance floor, the perfect location for napping on a chaise, or an overflow sleeping deck for the younger generation. Need a place to work out? There is room for two exercise machines. This area on the first FPB 97, now just starting construction, will be left totally open for maximum flexibility. A variety of outdoor furniture will be carried in the forepeak, so the space can be optimized for the current requirement. Speaking of FPB 97-1, the forward seating area and coaming sides will be in bare teak. The table will drop to create a giant day bed. We have specified what may appear as a surplus of grab rails. 99% of the time these will be excessive. But occasionally, maybe once every few thousand miles, the FPB 97 and a wave crest may meet in just the right manner as to induce an out of sync acceleration which has you reaching out to support yourself. When that happens, we want a rail close by. Notice the double rails around the perimeter. They help in the open areas. But equally important, any time you are seated there is a double close behind the cushion onto which you can grab. We are uncomfortable maneuvering a large yacht in tight quarters while being blind in some sectors. And the concept of depending on two way comms for distance from another vessel or the dock leaves us cold. The answer is shown above: a piloting station outboard and almost even with the deck edge. This is also a wonderful photo platform. And will provide a great place to watch ice and debris fields. All of the photos and talk lead up what you see and feel from and within this unique space after piloting yourself to some wonderful destination. 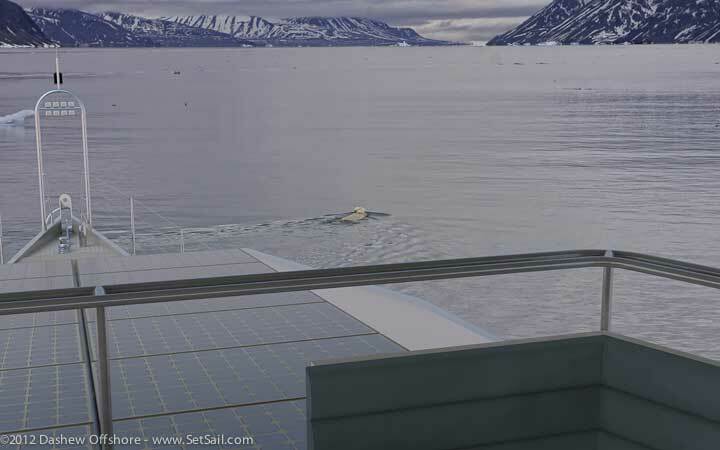 It could be a polar bear swimming at 79 degrees 45 minutes north latitude in one Svalbard’s exquisite fiords. Or a sunset so beautiful it moves you to tears on your way across the Atlantic. We’ll leave the other scenes to your imagination. This entry was posted on Saturday, January 7th, 2012 at 2:16 pm and is filed under Dashew Logs, Wicked FPB 97. Both comments and pings are currently closed. Wow. Amazing and confusing. How big is the yacht? I was sure it was somewhere in the windhorse range now I am not so sure. I am really lookng forward to the specs. Check “The Wicked One Revealed” post. All the specs are there. That looks like a whole lot of ship to not have a generator. Not sure about the clientele who will spend that kind of money and be limited on creature comforts. Best of luck to you Steve. I’ve enjoyed following your travels and developments. There will be a genset, but it won’t get a lot of use. Silence at anchor is about one of my ultimate creature comforts when cruising. There’s nothing worse then sitting in a peaceful anchorage on battery power when a stinkpot arrives, gives you a moment of false confidence when they kill the engine before turning on their genset and settling in for the night. This is the FPB115 without the wheelhouse. Steve —- The “pilot bridge” is turning out great. Heated and air conditioned? What kind of storm conditions will those Everclear type windows be able to stand? Thanks. We think it has potential. Heated for sure. Still undecided if air con is warranted. There are a lot of tradeoffs associated therewith and we have not yet worked through the details. When we were investigating the EverClear window system for WInd Horse we were told they regularly dealt with hurricane force winds in the Carolinas, and that for storage and heavy weather zipped closed was better than open. The sport fishermen that use this often run at 25/30 knots into 15/25 knots of wind. That looks like a glorious place to be. How does the solid pilot house roof affect self-righting ability? How is it supported forward? Looks as if there is a purpose-designed space for a small Triton sub on the aft deck?? I’m liking this more and more. The CG calculations and stability curve will balance out. Just a question of the vertical center of gravity. Between liquids, buoyancy, and skid factors we have not seen any problems, and this is without considering the buoyancy of the masts and the massive box girder between them buried in the roof. 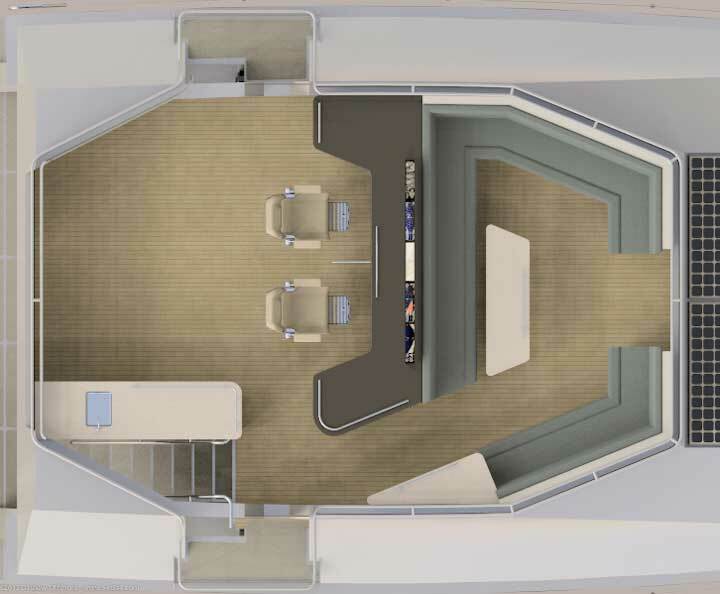 I love this new design i just hope u will be able to redesign in same style bigger sister FPB 115 i would seriously love in design of 3 deck yacht like fbp 115 is with style of this new ‘Wicked FPB’ but i assume it would rise up costs by alot. Maybe some day in the future. Right now we have our hands full! And if I see good, I think more surprise are going to coming up next!!! What a change in design!!! Are the two masts parts of one hot air exhaust system from the great room??? And if I understand good about what your write, this hull is a complete new version, different from FPB 64 and 83 and 112-115, Right??? Horse and the 115. Can’t wait to see what further developments the interior holds. Thanks for the insights into your design process. Perhaps Steve should start a friendly competition. Who can most accurately guess the length of the new FPB without going over. Sign me up for 29 meters (for fun) although I think Kerris nailed it at 30 Meters. 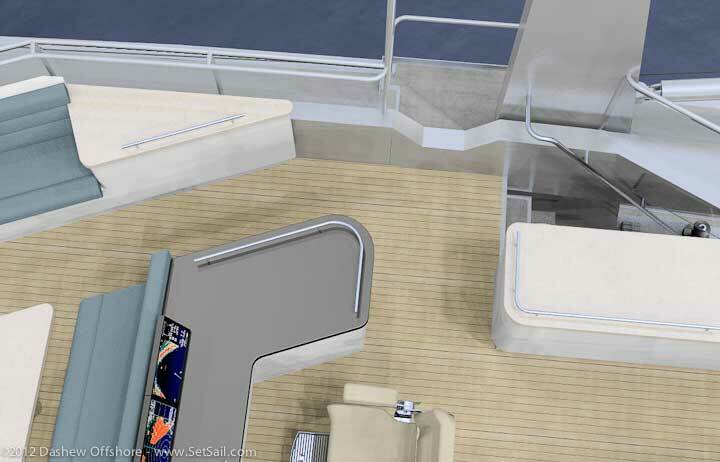 Space for a dumb-waiter from galley below and BBQ and sink @ aft end of pilot deck? 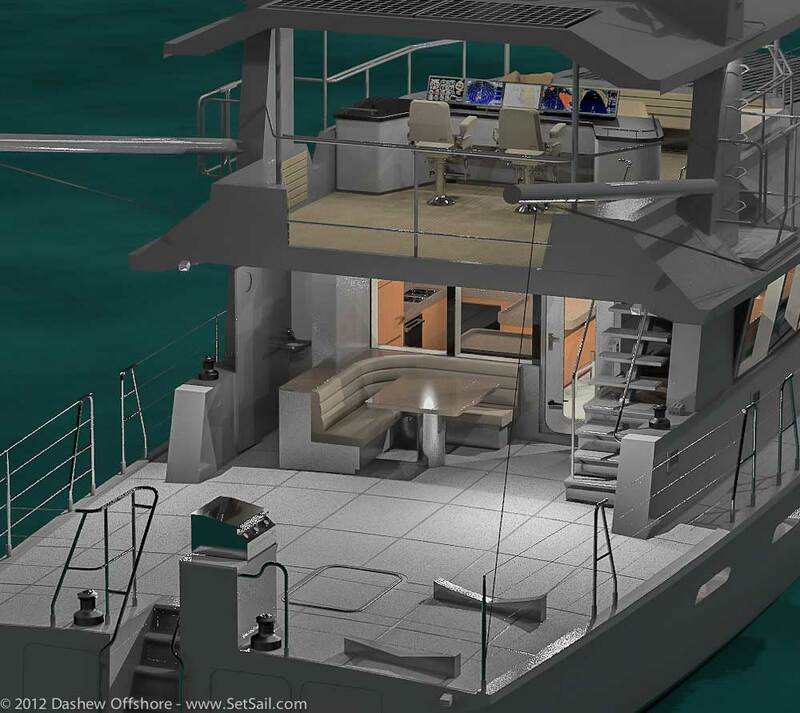 There will be a BBQ on the aft end of the main deck integrated with engine room air intake. Also a sink and counter on main deck for wash up. The upper deck will have sink and fridge. As to a pass up from the galley, as you have surmised this would have to be in the form of a dumb waiter, which of course has to be water tight and stand substantial inverted head pressure, so we are not yet sure if we can make this work or not. Maybe the dumb waiter could come from the BBQ area under the aft veranda on the main deck, thus eliminating the water tight issues from the great room? But once the food is outside might as well take it on up the stairs (which are quite flat, with large treads). Amazing design! From the scale of the pilot deck, it appears this yacht is of the size of Wind Horse. May be a series 2? As usual, wonderful, thoughtful stuff going on here. 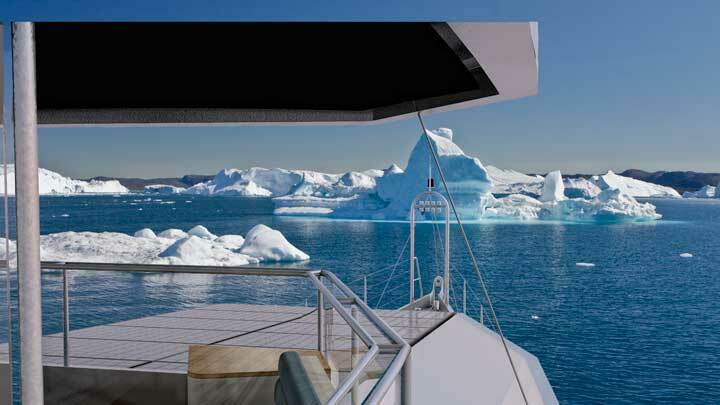 A non-boat question: what software are you using to get these renderings? The photo-realism is amazing and gives a great sense of being there. Renderings are done in Rhino 3D running their nXt rendering engine plug in. I was wondering how this space was so much bigger than on Windhorse, then I noticed that you have taken the Great Room overhangs right to the edge of the boat. Does this not compromise getting to the foredeck? I’m sure we will hear about this shortly. Wider side decks than the FPB 65 + headroom under the overhangs. Now that you have all our heads thinking,This is a little off topic but….. I was wondering if an IPS or Zeus pod style drive line would be a possibilty in this type hull design or is going to compromise the aft hull volume and draft to much. I could see many advantages to that type of drive system albeit more geared towards higher speed hulls…..????? Biggest hurdle with the pods is damage tolerance, or lack thereof. Think rocks, logs, ice. If the skeg remained as is to deflect debris and the pod was installed between it and the rudder why would a pod be any more susceptible to damage then a standard shaft and prop? Pods are a complex design issue and for us there are too many drawbacks, of which vulnerability is but one. ….is wondering why he might need to keep a house if he had a Wicked one! About noodeling, it was Everclear who make it clear!!! ??? If I were younger, I would gladly apply for the job of dumb waiter…. “Matrix Deck”; A Great name for a Great creation. Very clever. Rebellion against the “normal” Lets just fast forward two years and see the finished creation in all her glory! And the accommodation layout…..
Love Matrix Deck. Good choice. As I didn’t win I may have to just buy your daughter’s CD. I’m assuming 2 of the 6 cyl. John Deere’s but hoping the same engines on Wind Horse might have enough umph. You mentioned on the 64 that has the wing engine that with modern engine management systems running a larger engine under a light load isn’t as hard on the engine as it used to be. Also, if one isn’t moving the boat regularly how often should the engines be run? I’ve been told that in tropical waters the props should be spun every 10 days to keep marine growth down. If the generator won’t get used much anyway perhaps an AC generator with a constant speed drive could be mounted on each main engine and leave the diesel generator off. (Or just big enough DC generators geared to make good power at a slightly fast idle? That might be difficult as there is a very broad speed range. Maybe constant speed drives for the DC generators?) That way if you exercised each engine every 10 days you would have a generator available every 5 days without having an extra diesel to maintain. Short cycling engines unloaded is a bad practice in our opinion. If they are started, the should be then run under load. Better to clean the prop with a swim if required. Alternate AC is covered with a pair of 4kW alternators on each engine, so at cruise we are covered. But we feel he AC genset is still required in hot humid environments where the air con is going to have high power demands. I believe EverClear is a thermoplastic acrylic. Exposed to UV, acrylic life is 2-3 years. Acrylic absorbs water and this will affect transparencies. It does get scratched even when a soft cloth is used, as found in airliners. Cracks will eventually initiate and grow in acrylic (this is also true of other plasics like polycarbonate). Cracks have been observed in canopies of fighter aircrafts that use stretched acrylic (F4, F15, etc.). What is the projected lifespan of EverClear on the Matrix Deck? You might be wrong on your comps. Sounds like you are thinking about polycarbonates, the foibles of which we are well familiar with. On the Carolina sport fish yachts they expect seven to ten years with their EverClear. We saw seven year examples and it looked really nice. Now if only the boat was bulletproof to small arms fire and had a discharger of bear spray located around the great room, it would perfect for dealing with pirates off venezuela, brazil, and somalia. Beautiful boat Steve. Very innovative. I always thought the FPB’s were short on outside living space. That’s solved then with the 97. That matrix deck is just brilliant. But growing to 97 feet, this boats’ pricetag is only for the happy few. Downsizing to approx. 50 feet, now that would bring it within reach of a lot more people. Great Boats. Great blog. Can’t wait to see the interior arrangements. You’re “killin'” us here. At this pace y’all miss the Wildcat playoffs. You can sleep between games next month. This is an area that is up to the owners. Our only caveat is that they be hard wired to reduce the risk of electrical failure. Do you have any concerns with the matrix deck electronics and monitors being exposed to the weather? From what I have seen previously your monitors are pretty standard home office quality. The monitors are all high end sealed marine style. However, the Matrix deck desk area should be quite dry in most conditions with the windows open. She is wonderful. With a boat like this I would want to transit via a lot of areas that are particularly unsavory on my way to some fabulous places. Please consider that from time to time the boat may need to travel at a very uneconomical speed to make it a less attractive target for Piracy. Your engineering philosophy has always been to engineer for optimum cruise and efficiency and slow down to make a landfall at a sensible time. Would you consider oversize engines to still cruise at your optimum speed lower in the power band and still retain unused horsepower to be able to accelerate well past the optimum cruise speed for short durations while you run or wait for the cavalry to assist. The financial cost coupled with the weight penalty of oversize Engines and Boxes ultimately is a small price to pay for the ability to run. You would, sadly, have to change engine manufacturer to do so as John Deere does not have the Horsepower in the duty range. Lets just say at this point that if you were worried, wanted speed, kept the boat reasonably light, and retuned the engines from M3 to M5 (300HP each) you would be surprised by the performance. We are not going to get into the details right now, and prefer to let the boat speak for itself. But if you are willing to burn 30 USG/hr for fuel, and stay light, 1/3rd load would still take you close to 1000 miles at speeds faster than super yachts cross oceans and in the range of mid sized ships (where big is considered 250m and up). Steve, your modesty is much appreciated, but are you sure that it is warranted in this case. For us “mortals” watching the design and build process from afar, the boat cannot speak for itself. Knowing if “Wicked” could do 14 knots, 15 knots, or 16 knots+ would make the difference between using the boat on weekends or going somewhere interesting on a three day weekend or even more interesting over a week. At 11.7 knots, its basically “two weeks to everywhere” (paraphrasing “Oh Brother, Where Art Thou”) for much of tour audience. We have not done a detailed enough analysis to feel comfortable with what might be possible. However, it is probably safe to say that if you were in weekend trim, i.e. light on liquids, and running the engines at M5 rating/300HP, and had new props, then you could expect around 15 knots in smooth conditions. If I understand this correctly you are not limited by physical distance to do real time collaboration on design. You – the ship yard – the customer can all work real time. We use Skype for screen sharing and calling along with an Adobe product. So far today we’ve had three conference calls with computer screen sharing. Yesterday almost the entire 18 hours was spent screen sharing, with the added bonus of an Ipad camera being used to share details with us from t he Circa shop in New Zealand. I have really enjoyed them. The one question I have is there a way to lock off the upstairs to keep the honest thieves out? A security system for the stairs to the Matrix deck has been the subject of much trial and error, anguish, and computer time. We finally have a very simple, easy to use system. We’ll reveal the details when we get caught up. Does it look like a door? Think security shutter, the type that roll down, only this runs horizontally. The EverClear panels extend only as high as the handrials not all the way to the roof on the Matrix deck correct? EverClear being very clear it is difficult to tell in the renderings how far they extend. The vertical panels on the Matrix deck are acrylic. Everclear windows run at an angle from the top of the outer handrail to the underside of the roof. These are not yet modeled simply because to do so is an enormous amount of work and not yet required.